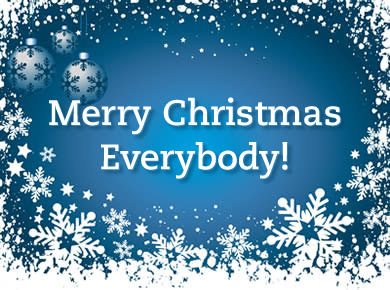 This will be a short post as it's past my bedtime! 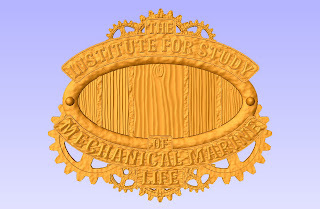 I have been sneaking in bits of time around my other modelling jobs to work on the Institute sign sample that will hang in the new shop. I re-arranged some of the gears and such to better accommodate 3 dimensions. I think I may put a fork in it now, as this turkey is done! I am looking forward to cutting it on Monday before we start the Lawyer sign. The fish is also ready to router. I will cut some of those pieces on the table-top I-Carver cnc we added to our roster on the last job. It's a small stepper based machine. Not nearly as fast as our beloved Techno, but he'll be busy with the large portions of the 2 signs. I have spent the last little bit over the holidays prepping an ever-growing list of 3D models for people. I do enjoy modeling in the computer. I actually find it very relaxing believe it or not! No finding space for finished pieces, not waiting for paint to dry, etc. I do love making things as well though, but the mixing it up between physical and CG is the perfect balance. I spent some time developing the sign that will hang in the new design studio. I think this sign will set the theme for the whole room. The space is a decent size at 12'X28" clear, and the best part is that it's a mezzanine, so it doesn't interfere with the actual shop space. We also will have a front entrance for sign customers to walk into, instead of right into the shop we have now. I drew up all the vectors in Aspire, and they are now ready to be built up into a relief. Most of the gears will be hidden by the oval plate in the middle. This will keep the center clean for the mounting of the fish model. 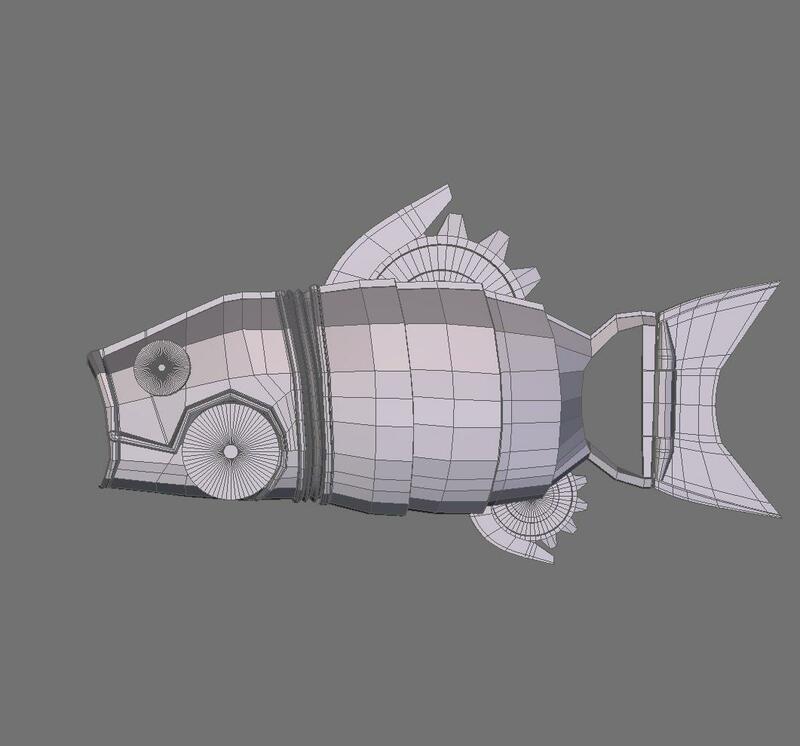 I wrestled back and forth between a cartoony style robot fish, or a more detailed movie prop type. I think the higher detailed version has won out though. 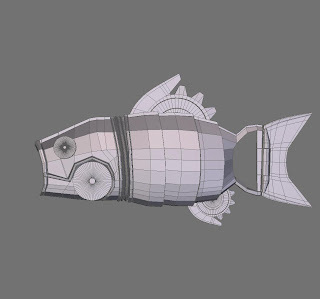 I started modelling the fish in Hexagon last week, but only got to spend small chunks of time here and there. I started with the head portion as this will dictate how the rest of the body will be. I am not modelling any particular fish, I am just making it up as I go along. Which, as you know, can result in alot of wasted time when a better idea creeps up. 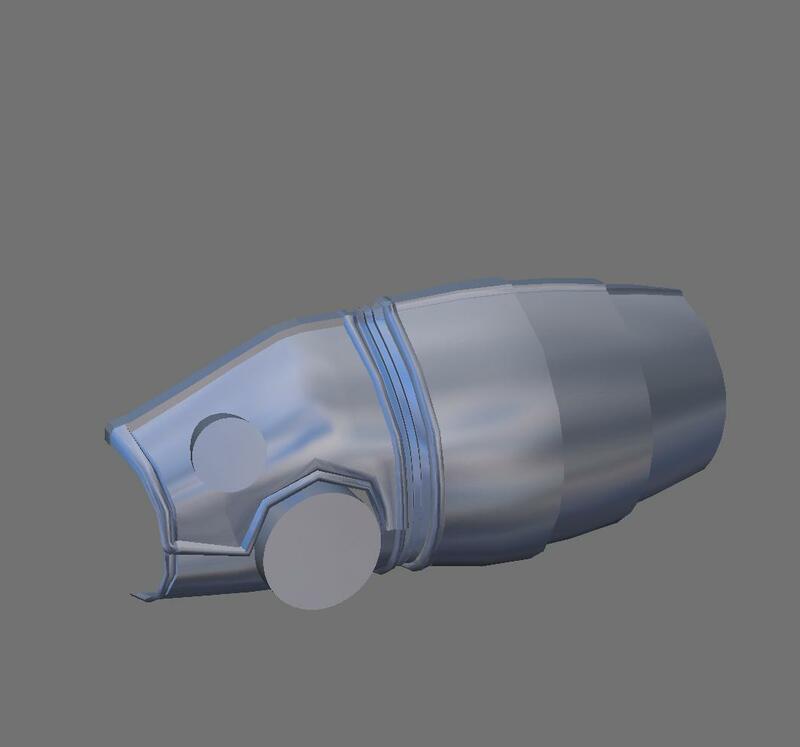 This fish will be made from a whole assortment of materials. As this is an indoor sign, I can be less restricted at build time. As the model progressed, I changed my vision quite a bit! I knew right from the start I wanted bow thrusters in the head, as well as porthole eyes. I may or may not light the eyes, I haven't decided that yet. All of the parts will be machined on our 2 machines, but not as 1 lump. 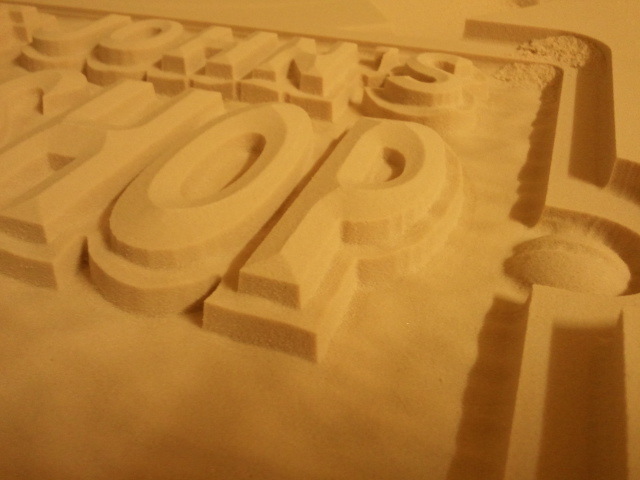 It will look a whole lot more intricate as separates pieces with alot of the detail added after the routers are done. 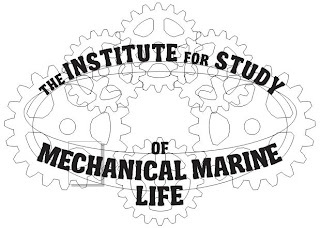 I want this fish to look like it was scooped from the ocean and returned to "The Institute", this means weathering-YAY! My favourite part. Our carving finally got finished at the printer! It came out pretty good for a sample. It could have used a smoother primer coat, but we were all in a hurry to see if it even had any possibilities. But it certainly has some applications. A way to combine the ease of printing with some depth! On the next test we will angle all of the vertical walls around 10 degrees for better ink coverage. Once clearcoated, it will be beyond durable. On this test, we just carved the woodgrain in about 3/32" and left everything else flat. 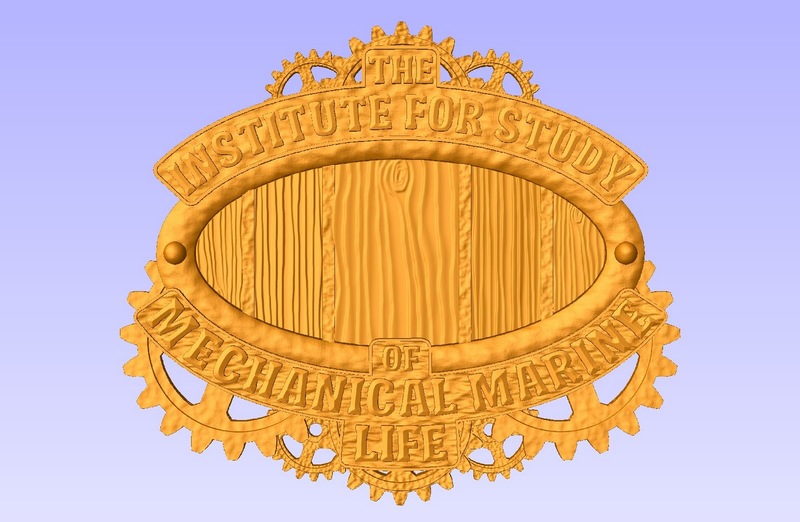 I am designing a new one that will have some carved elements that we will test again. It's just a matter of finding out how far the ink can shoot before it quits having clean edges. 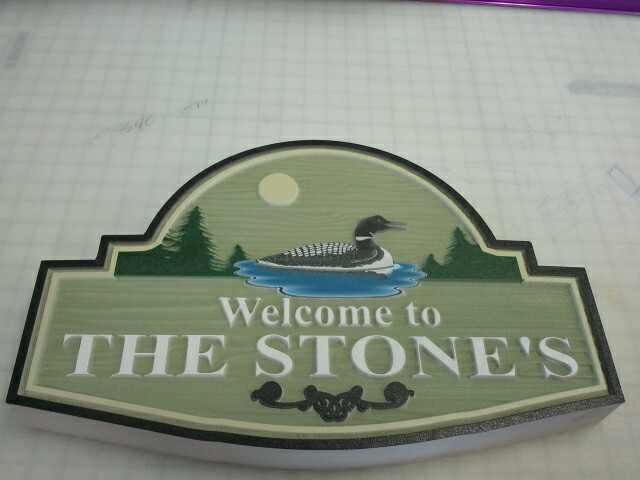 I got the second sign the we are going to run through the flatbed printer routed today. The small version came out pretty good I think, I'll post pictures tomorrow. 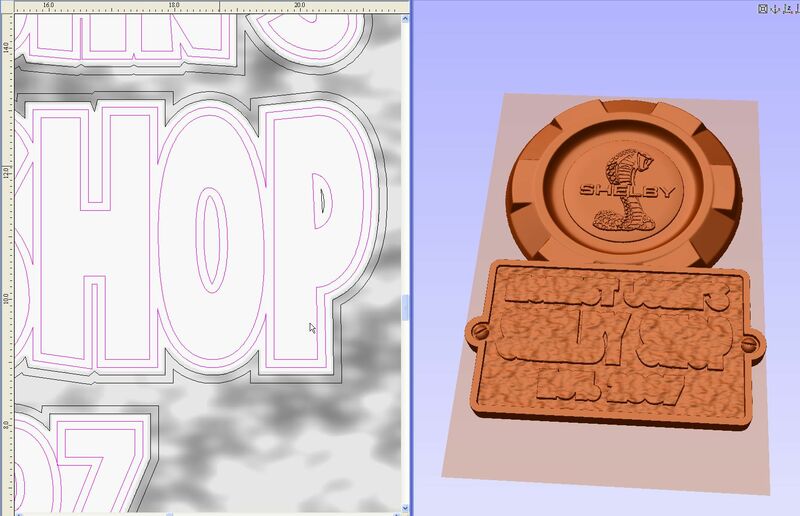 I have started designing another 2 signs as well. The first one is for a lawyer and will grace the yard in front of his business, and the other we will display in our office when it get's finished. We are gearing up for moving to a new shop in the new year. I am very excited! It has a second story mezzanine which we are going to convert into an office/ design studio. This is gonna be cool. I have always wanted space that I could do a cool theme in, and this is gonna be it. 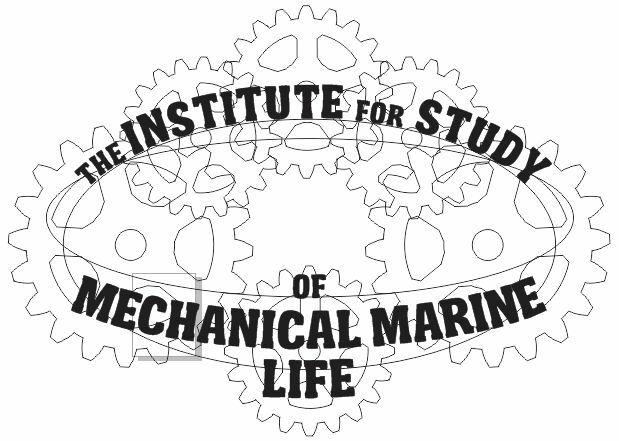 I'm thinking a captain Nemo/ steampunk theme that fits with the website theme. 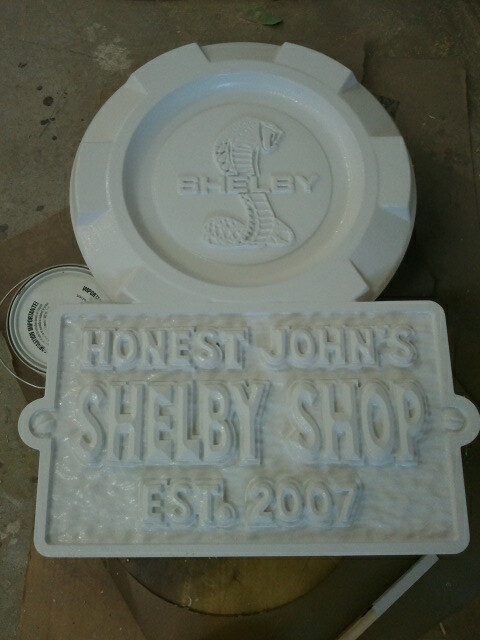 I also was able to get the paint on the Shelby sign while our Techno cnc was carving away. I went with black and silver, with blue behind the text. It's moving along pretty quickly, which is good because I have to deliver it by Tuesday at 5 pm. This will look pretty nice hanging in his shop! Fixing those jagged edges......the easy way!!! 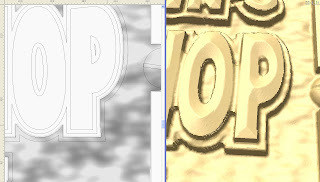 Yesterday I touched on smarter toolpathing to get rid of the jagged vertical edges that can crop up in Aspire. Especially if you didn't pick the right modeling resolution at the start of a project. I generally model at a very high resolution, but the jagged can still rear it's ugly head. One of the things to keep in mind when doing this is, a ball nose cutter on a 3D finishing cut is calculated to the CENTER of the cutter. Roughing passes are calculated to the EDGE of the cutter. 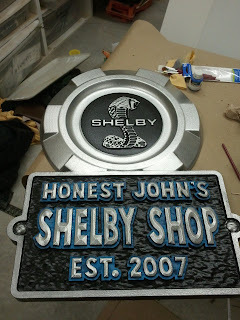 On the text of the Shelby sign, I have modeled the text, I also modeled an offset lip from the text, and then the textured base where all of this resides. 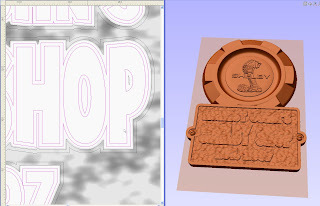 The text lip is there in case I want to add a color behind the text to make it pop. 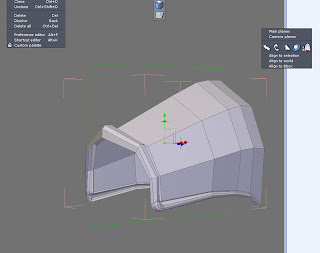 Here is the result of the first 3D toolpath. You can definitely see the jagged portions of the text. There are also a lot of places my 1/4" cutter was unable to get into. Now Aspire will do everything it can not to compromise the model in anyway, jagged and everything. This is why I kept all the text portions as separate components. I am using a 5.5 degree tapered ballnose for the text cleanup on this. It has a 1/4" shaft and tapers down to a 1/32" ball tip.I selected the vectors I used to generate the text portion, and offset them outwards by just over half the diameter of the previous cutter. As I used a 1/4" ballnose for that run, my offset was set to .130". This lets my small tapered cutter clean off the rad left by the 1/4" ballnose cutter, right back to the original text vector. Normally I would offset my original text vector by half the diameter of the tapered ballnose, but the results were so small it didn't matter much. Now before I toolpath this, I want to hide the text component as shown in the above image. This lets Aspire ignore the text portion on this particular cut, as we don't want it to try and protect the jagged edge text. 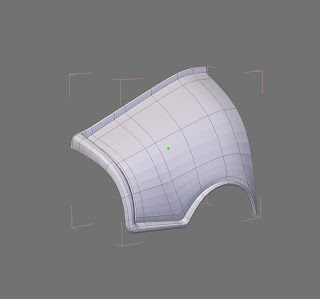 The next important part is to select an OFFSET 3d machining strategy between the two selected vector boundaries. This strategy will let the cutter follow the outline of the vector text, effectively milling away any jaggedness, while still respecting the geometry under it. I also repeated the process for the text lip. This process works wonders for vertical edge cleanup and can save a ton of hand finishing work later. The difference can be quite dramatic depending on the modeling resolution you choose in the beginning. Using this kind of toolpathing can even let you get away with a larger 3d maching stepover, which can be very noticable when it comes to the vertical edge. I got the first coat of primer on this one today, and will get the second one on tomorrow. I was also able to cut another sign today that will be an experiment between 3d textures and flat bed printing. That should be fun!